The appeal of accelerated bridge construction—where precast parts are pieced together and within hours installed over a roadway before being tested and reinforced for weeks—is that it minimizes road closures. The downside is that the smallest mistakes can lead to disaster. 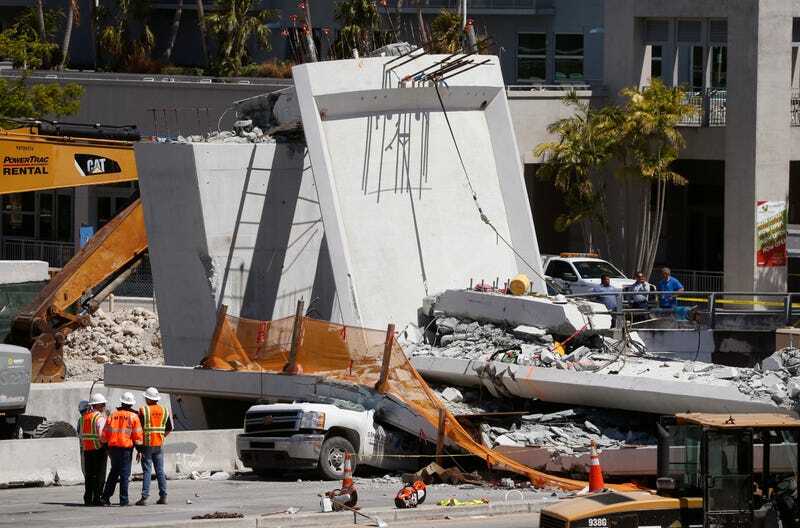 This method, used to build a pedestrian bridge at Florida International University that collapsed Thursday and killed at least six, is now under more scrutiny than ever. If all of that sounds unorthodox, it’s also why many public officials have gravitated towards accelerated bridge construction in recent years because, despite being more expensive, the work of finishing the bridge can go on while traffic flows below. FIU knows this method better than most institutions, having been home to the Accelerated Bridge Construction-University Transportation Center since 2010. That center has received millions in federal funding to “provide the transportation industry with the tools needed to effectively and economically utilize the principles of ABC to enhance mobility and safety, and produce safe, environmentally friendly, long-lasting bridges,” according to the AP. Because it has its own building department, the school was also in charge of approving plans, permits and inspections for the bridge. Although the structure spans a state highway, the Florida Department of Transportation was only tangentially involved, the agency said in statement issued Thursday. FDOT did raise one potential red flag: Under its agreement with the state, FIU was supposed to hire a “pre-qualified” engineering firm to conduct an independent design check — meaning a firm previously approved by the state. FIU used a large international firm, Louis Berger, that was not pre-approved, according to FDOT. The concrete bridge’s design was supposed to be visually distinctive, but with that aesthetic consideration came a cost; one engineer told the Herald that bridge was some 10 times heavier than if it was made with steel bridge, a much more common material for pedestrian bridges. Still, the Tallahassee-based Figg Bridge Group, which created the design, is known for its competence, the engineer said, having designed a lauded new span on Interstate 35 in Minneapolis after a deadly bridge collapse there in 2007. It’s more likely, instead, that investigators will now zero in on the ABC process itself, which can leave the bridge vulnerable to collapse for weeks during construction. Until it’s fully secured, a quick-build structure is unstable and requires the utmost precision as construction continues. Properly shoring up the bridge can take weeks, a period during which even small mistakes can compound and cause a partial or total collapse, said Amjad Aref, a researcher at University at Buffalo’s Institute of Bridge Engineering. For ABC, the stakes of the investigation into the collapse could not be higher. And a lot of people in Florida will be demanding answers as to how this happened.